Experience your day in bustling İstanbul, discover historical treasures of Romans and Ottomans. Arrival to İstanbul meeting us and transfer to the hotel. After check- in the hotel your tour starts. Experience your day in bustling İstanbul, discover historical treasures of Romans and Ottomans. Drive to Cappadocia, Antalya, Pamukkale, Ephesus and feel the sipirit of the ruins and back to İstanbul. Upon your arrvial to İstanbul, you will be met and transfferred to your hotel. You will be picked up from your hotel at 09:30. This tour includes a guided tour of Golden Horn, a visit to Spice Market & Private Cruise Boat trip on Bosphorus water channel. At the End of the tour, you will be dropped to your hotel. you will be picked up from your hotel at 09:30. You will see Old city -Sultanahmet area walking tours visiting Hippodrome and Blue mosque, Hagia Sophia Museum & Topkapi Palace and Grand Bazaar. At the End of the tour, If you want to travel by bus you will be dropped to Bus Station or If you want to travel by plane you will be transferred to Airport. You will be met and transffers to your hotel. you will be picked up from your hotel at 09:15. The first stop is Göreme Panoramic view. You will see fairy chimneys. The second destination is Derinkuyu underground city which is 3500 years old. You will go 8 floors down. The third destination is Ihlara Valley. You will hike about 3.5 km. At the end of the valley, you will have lunch in a village. After lunch, the next stop will be Yaprakhisar Panorama where you will see conical shapes which are similar to ‘Star Wars Movie Set’. And then you will be taken to Selime Monastry. You will comprehend monastic life better when you get there. After Selime monastry you will see Pigeon Valley. At the end of the tour, you will see onyx factory. (volcanic stone workshop). Your tour will finish at 17:30 and you will be dropped to your hotel. You will be picked up from your hotel at 09:15. The first stop will be Uçhisar Castle. You will be given information about the history of Cappadocia. The next and the most important stop is Göreme Open Air Museum where you will undertsand the influence of the religion(Christianity). After this stop you will see Çavuşin Old Village and Paşabağı and then You will have lunch in Han restaurant (open buffet) in Avanos. After Lunch you will see Pottery demonstration. The Next stop will be Devrent Valley whic is also known as Imagination Valley. Fairy chimneys in Devrent Valley resemble some animals and the hat of Napoleon Bonaparte. After this stop you will be shown Three Beauties of Ürgüp. 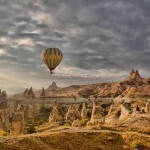 These are the most Beautiful Fairy Chimneys in Cappadocia. At the last point you will see Carpet Factory where you can find hand-made Anatolian Carpets. Your tour will finish at 17:30. At the End of the tour you will go to Antalya with bus. We pick you up from your hotel and start to full day archaeological tour with an ancient glorious theater of Aspendos. Before lunch we continue to our tour with Perge ancient city which share all its beauty with us. In the afternoon we find to chance to walk through to ancient-modern city Antalya and visit one of the biggest archaeological museum in Turkey. Tour details: In this tour we have an ancient city walk on flat ground in Perge and a theater visit in Aspendos. There is no walks on rough surfaces and hiking. Museum is entirely indoors. We start with picking you up from your hotel by busses at 09:30 and driving to Kemer harbour. Then we get on our boat and cruise to ancient port city Phaselis. We enter the city through the same door which once builded in the name of glorious Roman Emperor Hadrian. After sharing of shiny history of Phaselis we get our lunch on boat and we cruise to Three Islands for an afternoon swim in the crystal clear water of Mediterranean Sea. Then we come back to Kemer and get off the boat and turn back to hotel by 17:30. At the End of the tour you will go to Pamukkale with bus. Upon your arrival to Pamukkale you will be met and transferred to your hotel. You will be picked up from your hotel at 09:30. Your Pamukkale day tour begins with a visit to the red springs in the nearby village of Karahayit. We then enter Hierapolis from the North Gate, visiting the Necropolis, Bath and Basilica, Frontinius Gate, Frontinius Street, Latrina, Northern Byzantine Gate, Fountain of the Tritons and the Temple of Apollon. You will be given free time to swim in the Cleopatra Antique Thermal Pool (admission fee extra) and will finish the Hierapolis portion of the tour with a visit to the large and well-preserved Theatre. We finish the tour with a visit to the Travertines (white calcium pools) where you will have time to take pictures and wade in the water. After leaving the site, we will have a late lunch, and then you will be dropped back to your hotel. You will stay 1 night in your hotel and you will have a free day in Pamukkale. You will be dropped to Bus Stationand you will go to the Efes with bus. Upon your arrival to Ephesus, you will be met and trasferred to your hotel. You will be picked up from your hotel at 09:30. Ancient hospital, health center and propylaeum of the Temple of Athena. At the end of the tour you will be dropped to your hotel. You will be picked up from your hotel at 09:30. Your your starts from the port of Kusadasi proceed to the House of the Virgin Mary. Then you will see Ancient Ephesus and Temple of Artemis (Diana).